Just a little behind this weekend, but I wanted to get my second weekly post in. Hope all is well with everyone on this day! 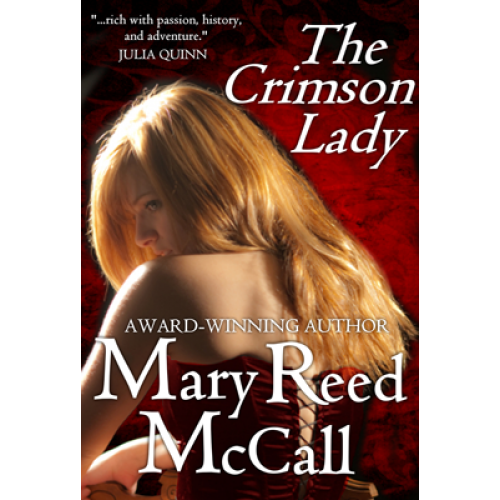 Disclaimer: The following is my opinion of Mary Reed McCall’s THE CRIMSON LADY. This book was purchased by me at Who Dares Wins Publishing and I’m sharing my thoughts simply because I want to! Braeden de Cantor (such a cool name, too) is exactly the type of hero every woman wishes would walk into her life. Although we meet him a fugitive, he is steeped in honor and integrity. Reluctantly, he upends Fiona Byrne’s world by making her accompany him, certain she is the key to finding his missing foster sister. He also needs to confront his uncle, who imprisoned and tortured Braeden, most likely kidnapped his sister and marred his good name in a world where honor is everything. Fiona is three years escaped from the world of prostitution, into which she was sold at age fifteen. That time she spent burying her alter-egos, Giselle and The Crimson Lady. She has also re-established herself as a respectable widow in a world where prostitutes are looked down upon and are not to be associated with by people of genteel society. Braeden’s quest is a major threat to her fragile peace, especially when he leaves her no choice but to lead him to the group of outlaws with whom she partnered in the past, as they are the only ones who can connect Braeden with the man who is responsible for his sister’s disappearance. This same man, who purchased and imprisoned Fiona (physically, mentally and emotionally) is also the only one who can restore Braeden’s good name. This story was well-written and peppered with enough period detail to get me looking up words and learning more about medieval times, the clothing of the time and vocabulary specific to that era. I look forward to more from this author. Have a great day and weekend everyone. Please remember to take a moment and click a SHARE button if you’re so inclined. See y’all next week!